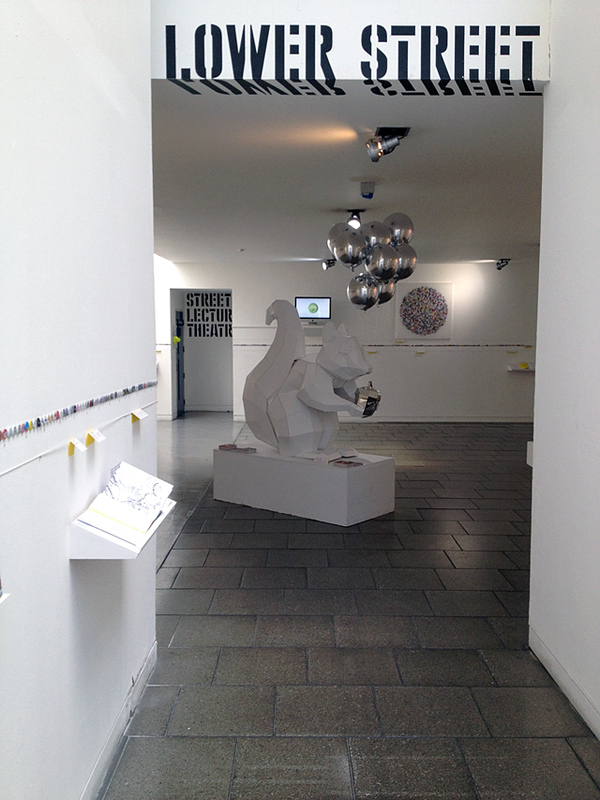 1 party squirrel, 1 exhibition catalogue – available at stereohype.com. 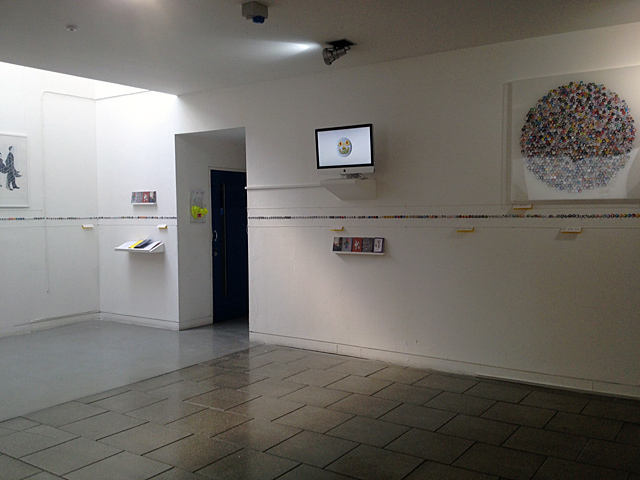 There are quite a few interesting ways to display Stereohype's whole 1,000-strong collection of tiny one inch (25mm) button badges in a big gallery space and we developed the most appropriate ones for Stereohype's 10th anniversary exhibition – including showing them all next to each other in a giant 30m-long line along the entire gallery walls. 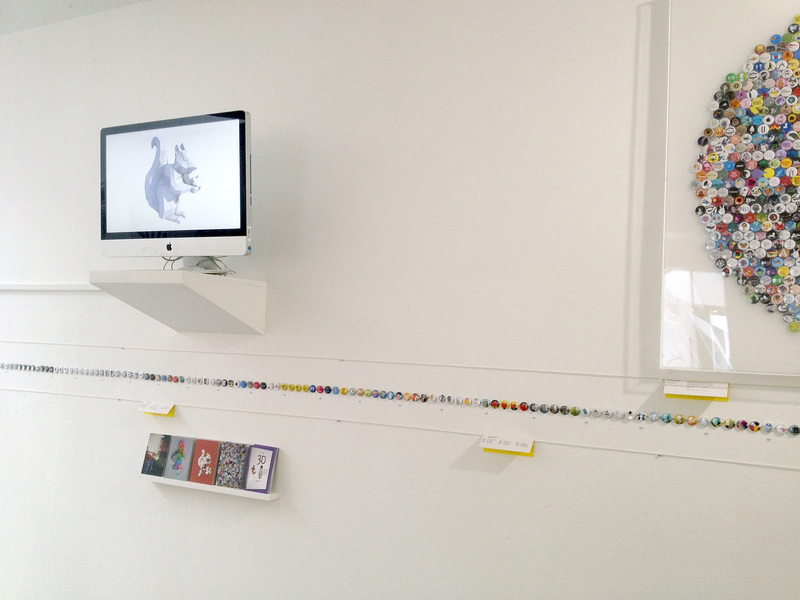 ___ To complement this – every single one of the 1,000 button badges were also displayed in a super-compressed, bespoke FL@33-designed perspex frame (one square metre) showcasing the collection at one glance. 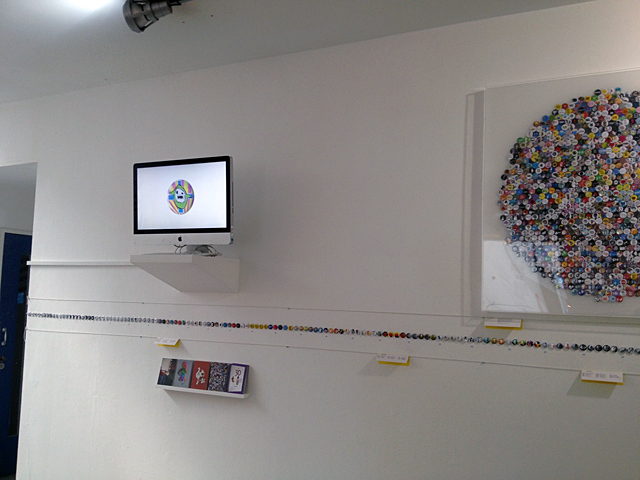 ___ The video loop of over 10 minutes shown here was displayed during the exhibition. 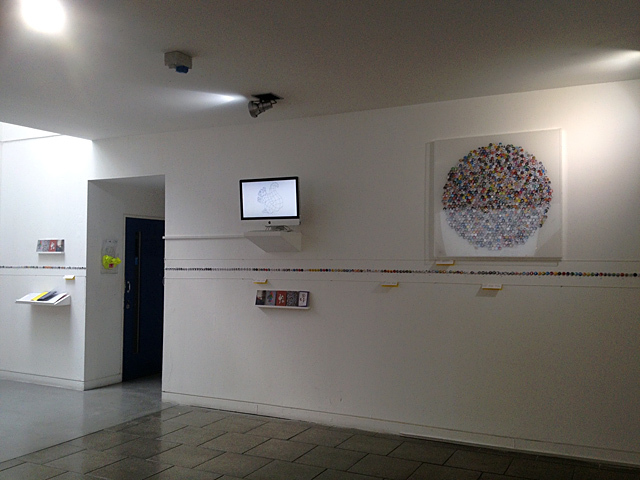 It was created for the gallery environment and with an exhibition audience in mind. 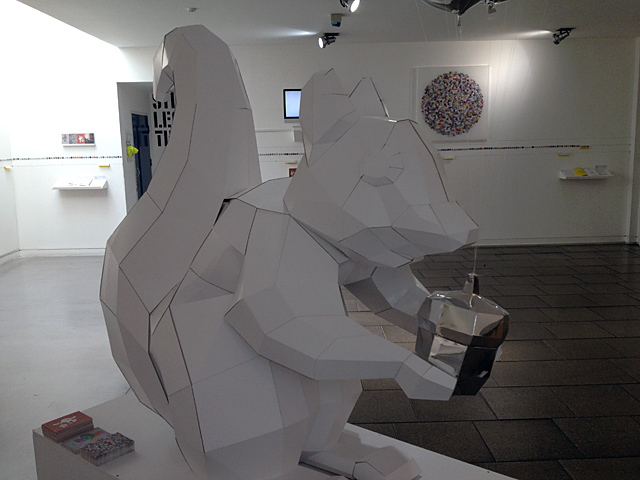 It features a few sequences of Stereohype's current squirrel incarnation – a low-polygon 3D design shown here – rendered with surface and as wire-frame. In addition this video also shows two sequences of Stereohype's first 1,000 button badges – one slower and one very fast one. 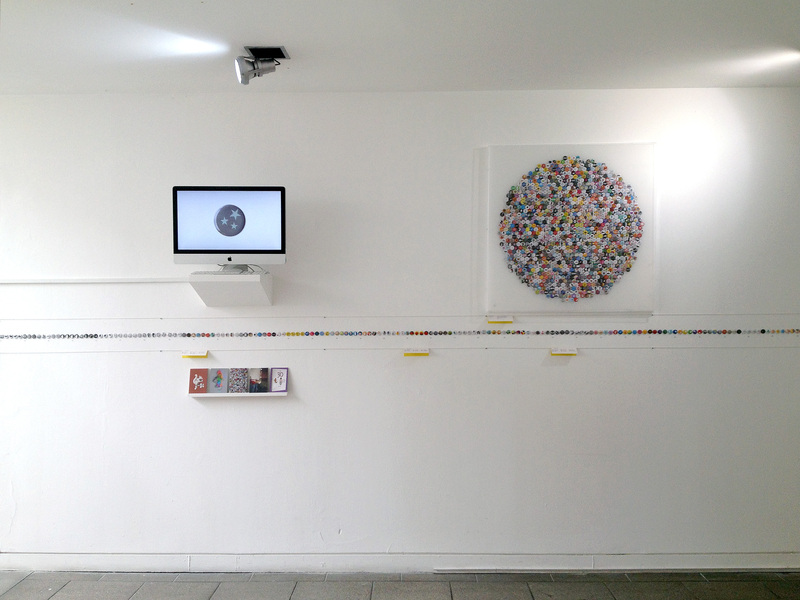 ___ The FL@33-curated and designed exhibition Stereohype 2004–2014 also involved developing various other exhibits including commissioning the 10×10 Poster / Badge Anniversary Series, designing the anniversary book Stereohype 2004–2014, compiling B.I.O. 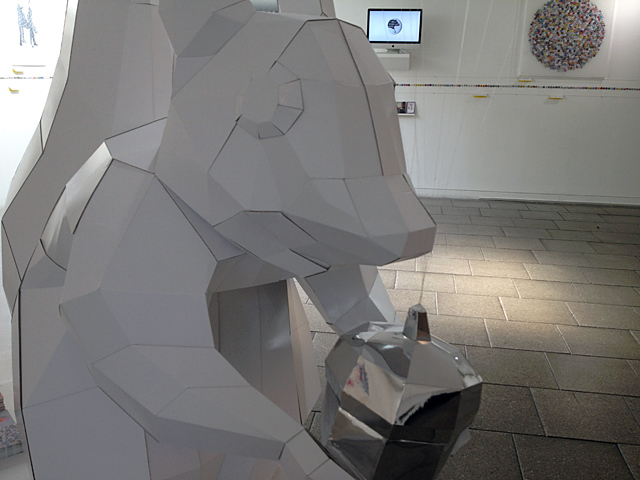 (By Invitation Only) Series 14 and designing and building a huge squirrel sculpture. 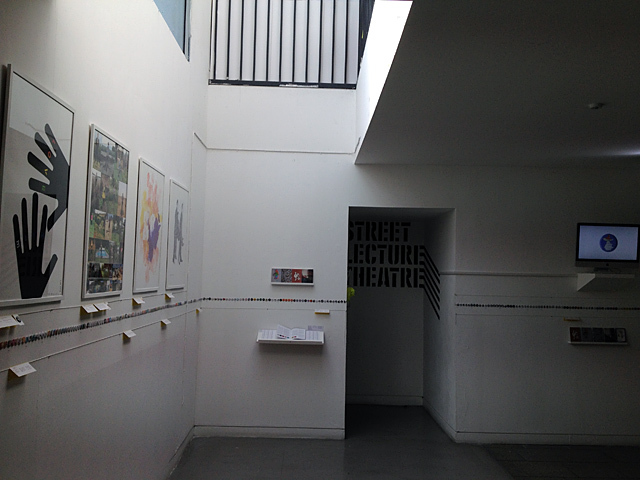 ___ The Stereohype 2004–2014 show opened its gates in September 2014 during London Design Festival and as part of '160' – a series of exhibitions all hosted by the London College of Communication (LCC). The exhibition was initially running for seven weeks and was then extended for an eighth week due to poplular demand – closing in November. Agathe Jacquillat and Tomi Vollauschek of multi-disciplinary design studio founded Stereohype in October 2004 – not just as an experimental playground for the London-based creative duo, but as an international platform for both emerging and established talents alike. ___ Stereohype’s product range includes printed T-shirts and an ever-growing button badge collection that consists of winning designs entered to the label's annual badge design competition (now in its 10th year) plus badges created specially for Stereohype’s By Invitation Only (B.I.O.) initiative. Various other badge design projects are also added to the range occasionally. 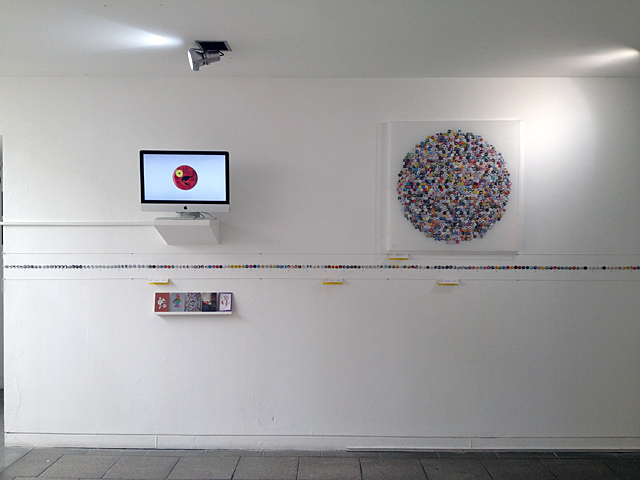 London College of Communication is hosting a trio of exhibitions, launched as part of London Design Festival 2014, showcasing 50 years of illustration, 100 years of graphic design and ten years of Stereohype's button badges. 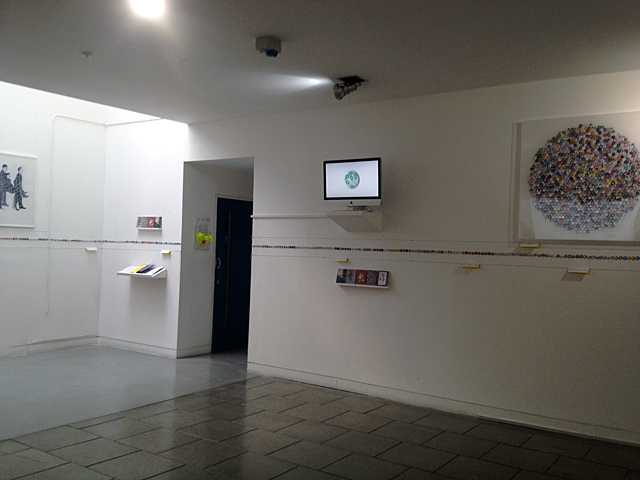 ___ The exhibitions are open at LCC until /// UPDATE /// Extra week added – exhibition extended due to popular demand. The show now runs until Saturday 8 November (was late October) and include a look at a new Laurence King book on illustration, a collection of 1,000 badges from Stereohype and an exhibition celebrating poster designers Tom Eckersley, Abram Games, FHK Henrion, Josef Müller-Brockmann and Paul Rand. 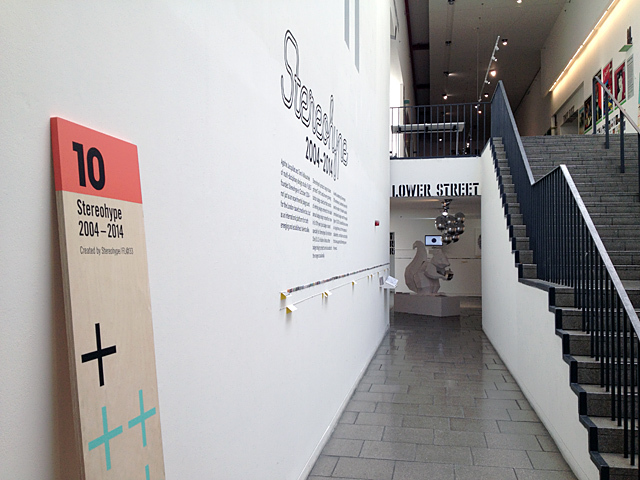 Speaking about the exhibition, Professor Lawrence Zeegen explained: ’160′ at London College of Communication celebrates the work of numerous influential designers and illustrators across the past 100 years. 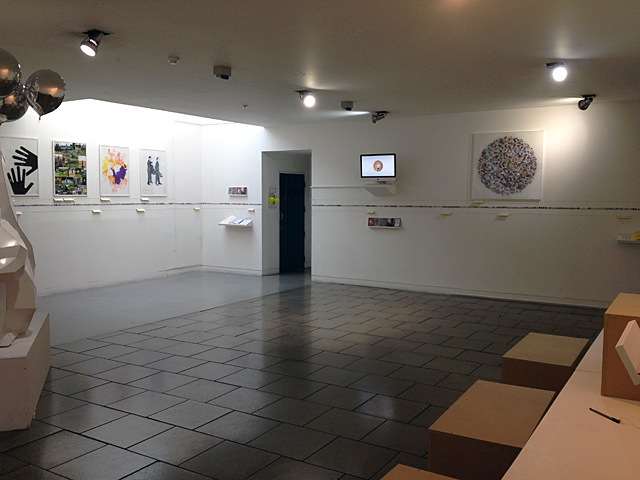 Reflecting the disciplines of graphic design, typography and illustration, all taught and researched within LCC’s School of Design, this trio of exhibitions has been curated to inspire and inform today’s and tomorrow’s generations of design creatives. ___ Launched during the London Design Festival 2014, ’160′ aims to highlight the invaluable connectivity between design industry and design education, many of the exhibitors across all three exhibitions having studied or taught at London College of Communication. October 16th, 2018 — We are over the moon that the FL@33-commissioned Stereohype 10th anniversary poster collaboration with Vaughan Oliver is featured in the beautiful publication Vaughan Oliver: Archive. April 9th, 2015 — We launched the all new, singing and dancing, FL@33-designed website of our sister-company, graphic art label Stereohype, a few days ago. Today we posted a few pictures and design insights here at flat33.com.